When comfort is required but privacy is not. Also known as Biscuit and/or shoulder puck, the Speaker microphone includes speaker, microphone and PTT button in one compact unit. Having the speaker integrated with the microphone and PTT button allows for quick response to radio calls as well as for users to adjust the volume to their liking. If added privacy is required the Speaker microphone has an integrated ear piece jack which allows any 3.5mm ear piece to be connected. 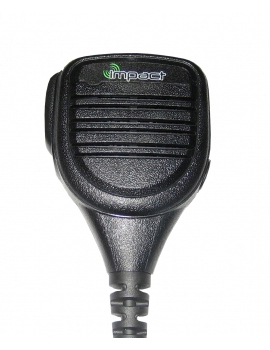 The speaker microphone is commonly used by police on the streets, bicycle riders, motorcycle riders and while driving a car.